The long-awaited DfT report into the effectiveness of 20mph speed limits was published earlier today (22 Nov, 9.30am). The report says there is not enough evidence to conclude that there has been a significant change in collisions and casualties following the introduction of 20mph limits in residential areas. The research has been carried out by Atkins, Aecom and professor Mike Maher (UCL), who were commissioned by the DfT in 2014 to address a gap in the evidence available on the effectiveness of 20mph speed limit (signed only) schemes. Twelve case study schemes were studied, from a variety of area types, road types and scale. Road Safety News will cover the report in more detail in the next 24 hours once we’ve had time to digest its content, and heard from stakeholders. In an open letter to local authorities, Jesse Norman, road safety minister, said: “Overall the introduction of 20mph limits led to a small reduction in median speed (less than 1mph), but vehicles travelling at higher speeds before the change of speed limit reduced their speed more than those already travelling at lower speeds. “The study found insufficient evidence to conclude that in residential areas the introduction of 20mph limits had led to a significant change in collisions and casualties. “Overall, there was a small but statistically significant improvement in reported levels of cycling and walking. 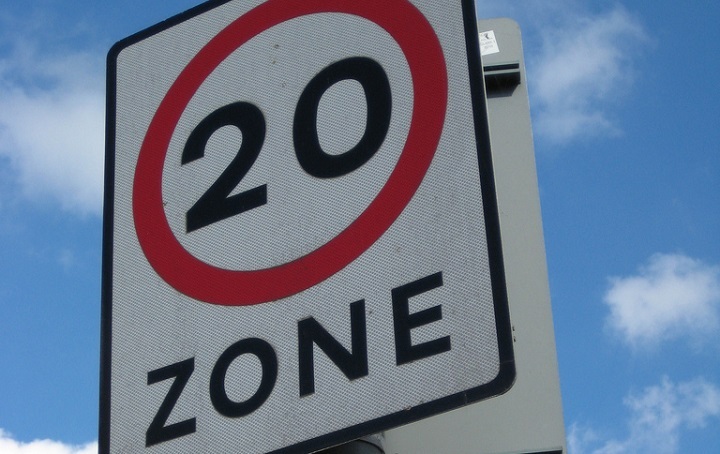 Road Safety GB welcomes this evaluation of the implementation of 20mph limits – it something the road safety profession, engineers and educationalists, has been calling out for and been anticipating for some time. “Whilst there may still be many unanswered questions, the initial findings confirm a primary benefit of 20mph limits is in the creation of an environment where more people feel prepared to walk or cycle. “A key, as yet unanswered general question, is around the direct casualty reduction benefit of such lower speed areas. As is the case with many road safety interventions, we rely on other indicators to extrapolate lower casualties or lower severity; in this case it’s a measurable reduction in mean speeds as well as the general acceptance from most drivers as to the concept of 20mph limits. “The argument that drivers who would travel at 35+ in a 30mph limit would reduce their speed to 25+ in a 20mph limit is good news for impact speeds, but of course would eventually draw criticism of the police if those ‘above the limit’ speeds were maintained. “Enforcement will still be a critical factor in encouraging drivers to slow down and to support the enhanced public perception of safer streets, which is why generally police support ‘self-enforcing’ 20mph limits – and ultimately it is cash strapped local highway authorities who will face the burden of implementing such new speed limits. “We welcome the report. It demonstrates that those authorities setting the context for their future liveable cities and active travel by means of wide-area 20mph limits are achieving similar results in terms of speed and casualty reductions as those spending money on more traditional road safety interventions. But having set that context, the 20mph authorities will be able to build with additional active travel interventions which all build on that context. We note that public and community support for 20mph limits is high. “The report also showed that police enforcement, or lack of it, was a key driver in compliance levels but the report did not look at how these varied amongst the case studies chosen. Our experience shows us that the key factors in speed reduction and outcomes are whether an implementation is authority-wide, the level of cross party political support, the level of multi-agency support, police enforcement and the level of community consensus change engagement. We would have preferred evaluation comparing these across case studies to understand the relative influence of such factors. “We also note that the choice and aggregation of speed data may well have blurred the results. GPS speed readings were said to be just 3% of actual vehicle movements and may well be biased due to only being measured on TomTom devices with GPRS feedback or on software update. In addition static sites measurements tend to be at free-flowing positions. Whilst accepting these limitations they do show the difficulty of using such data. “Some key messages were that the lack of enforcement increases non-compliance and needs to be enhanced. Independent Speed Adaptation on “works vehicles” could also condition this. And both of these work so much better when the correct limit of 20mph (as endorsed by WHO, OECD, ETSC, etc) is set for where vehicles mix with pedestrians and cyclists. In addition a national media engagement that “20 is plenty where people are” would consolidate the developing consensus that the report shows exists.